Personalized medicine that works for you. The future of genetic telemedicine is here. Over the past 20 years, advancements in research and the understanding of genetics have created a boom in patient demand for genetic tests. According to the National Library of Medicine, less than 300 genetic tests were available in the 1990s; in contrast, at the end of 2012, almost 3,000 genetic tests were available. This increase has led to the dramatic rise in the need for genetic specialists who can choose the proper test, as well as interpret testing results and guide patients through care plans and options. With genetics specialists in high demand, the Center for Medical Genetics has created a telemedicine option to provide access to genetic testing and counseling services to low-access populations. Much like video capabilities that make chatting with relatives and friends or conferencing with colleagues around the world instantaneous, “telegenetics” can be an effective way to expand genetic services to under-served patient populations. There are many benefits to both patients and providers, including saving patients time and costs, as well as reducing the disruption to a patient’s daily routine by limiting travel time or time off work that would otherwise be spent at a doctor’s office. During a telegenetic counseling session, we review a patient’s personal and family history and discuss options for genetic testing and cancer risk reduction. 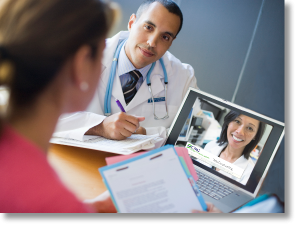 By providing genetic telemedicine virtually, we are able to maintain the patient-provider relationship while making these services more convenient and accessible for patients who are unable to make the trip to one of our clinics. For more information regarding our genetic telemedicine counseling services click here.